The tenth child of Henry and Emma Alexander Owens was named James Cleveland when he was born in Danville, Alabama on September 12, 1913. "J.C.", as he was called, was nine when the family moved to Cleveland, Ohio, where his new schoolteacher gave him the name that was to become known around the world. The teacher was told "J.C." when she asked his name to enter in her roll book, but she thought he said "Jesse". The name stuck and he would be known as Jesse Owens for the rest of his life. James Cleveland Owens was born in Lawrence County, Alabama, in the Oakville community, to Henry and Emma Owens. When Owens was nine, he moved to the Glenville section of Cleveland, Ohio. 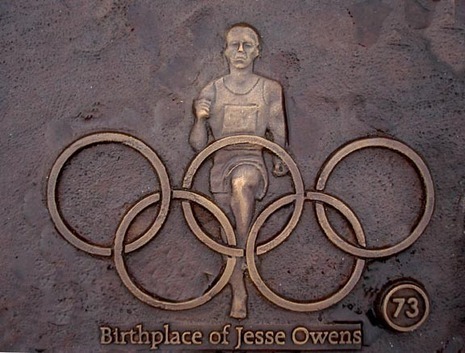 Owens was called Jesse by a teacher in Cleveland who did not understand his Southern drawl when the young boy said he was called J.C. Owens – i.e. James Cleveland Owens. Born September 12, 1913, Oakville, Alabama, U.S.—died March 31, 1980, Phoenix, Arizona) American track-and-field athlete, who set a world record in the running broad jump (also called long jump) that stood for 25 years and who won four gold medals at the 1936 Olympic Games in Berlin. His four Olympic victories were a blow to Adolf Hitler's intention to use the Games to demonstrate Aryan superiority. Jesse Owens, the son of a sharecropper and grandson of a slave, achieved what no Olympian before him had accomplished. His stunning achievement of four gold medals at the 1936 Olympic games in Berlin has made him the best remembered athlete in Olympic history. The seventh child of Henry and Emma Alexander Owens was named James Cleveland when he was born in Alabama on September 12, 1913. "J.C.", as he was called, was nine when the family moved to Cleveland, Ohio, where his new schoolteacher gave him the name that was to become known around the world. The teacher was told "J.C." when she asked his name to enter in her roll book, but she thought he said "Jesse". The name stuck and he would be known as Jesse Owens for the rest of his life.